(April 18, 2019) View map, click here. Bill Haase, wildlife resource management supervisor, said all open burning, including campfires, is banned until further notice on the Oahe Wildlife Management Area along both sides of the Missouri River. While the use of portable propane grills is allowed, extreme caution is advised due to the heavily vegetated area. In addition to Oahe WMA, surrounding areas included in the open burn ban include General Sibley Park, East Sibley Park, Kimball Bottoms and MacLean Bottoms managed by the Bismarck Parks and Recreation District; Kimball Bottoms Off Highway Vehicle Area managed by the U.S. Army Corps of Engineers; and Little Heart Bottoms and Graner Park managed by Morton County Parks. Oahe WMA covers more than 16,000 acres along Lake Oahe south of Bismarck-Mandan, in portions of Burleigh, Emmons and Morton counties. Burning restriction signs are posted at all entrances to the WMA. Residents are urged to follow the precautions in theND Rural Fire Danger Guidewhich lists the outdoor activity guidelines for the five danger ratings (Low, Medium, High, Very High, and Extreme). Emmons County has declared a Fire Emergency and instituted a Burn Ban effective April 27 thru October 1, 2018. The burn ban is in effect when the North Dakota Rangeland Fire Danger Rating for Emmons County is “Very High” or “Extreme” and/or a Red Flag Warning has been issued. Controlled Devices: Only when device (gas, charcoal, or wood-fired grills; patio fireplaces and chimineas; gas camp stoves; and smokers) is on a hard, non-organic surface and 15’ away from vegetation and an extinguisher or water is available on site. THE PENALTY FOR VIOLATION OF THIS BURN BAN IS A CLASS B MISDEMEANOR (NDCC 37-17.1-10.1: MAXIMUM SENTENCE OF 30 DAYS IN JAIL AND $1,500 FINE). The rangeland fire rating can be found on the ND Department of Emergency Services' website; or by contacting the Emmons County Sheriff’s Department. If a citizen is ever in doubt regarding what they can and cannot do, they should contact their Emergency Manager or local Fire Department. 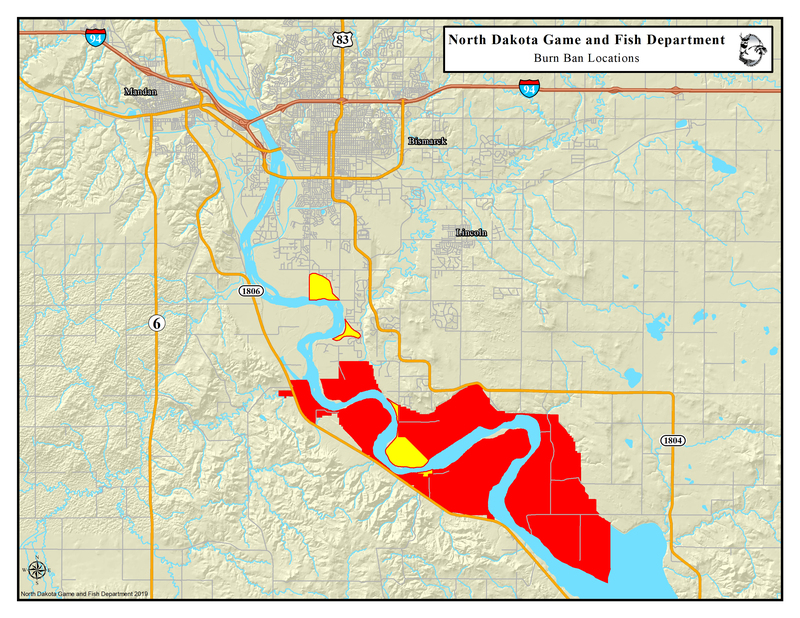 Click here to go to the current map of ND Burn Bans in Effect.